For your consideration, a booklet and print. The thirty-eight color and b/w pictures are mostly singular images that I made and posted here on the blog, and not work from my larger projects (Camp Home, Early Places, or Fast Food). Edition: 150 pairs available (54 remaining). 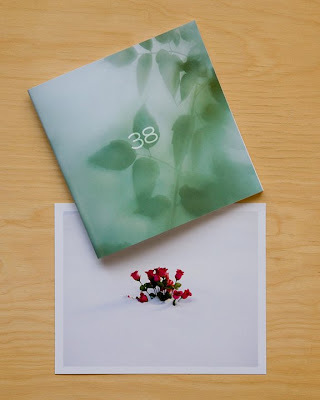 Title: 38. Saddle stitched, 6x6". Print title: Cemetery Flowers, Fish Creek, Wisconsin. Digital c-print on Fuji crystal archive matte paper, 7x5.5". Really cool, Kevin -- congrats! Consider me first in line. I have something similar in the works, if I can only finish getting my head around it. Interesting. Looks great. Can you describe your bookmaking process? Did you print and bind the book yourself? Thanks, though Don in Las Vegas beat you to the punch. Can't wait to see a book coming from JLPFL! Hope all's well with you. can't wait, just ordered mine! Can I buy one direct from you rather than using paypal? FYI, you can also use a credit card from that checkout page - but since I know how to track you down, you can send me a check :) Thanks! the print is gorgeous. the presentation so super simple and beautiful. I am thrilled I won one. Thanks Kevin. I received my envelope yesterday. The book is lovely and I can't wait to get the print up on a wall. I am going to hunt for the perfect vintage frame. i was browsing through the miad library tuesday and i came across this. it made me smile. i have my own copy at home.